Wholesale suppliers and exporters of Albizia Bark and Siris Bark. 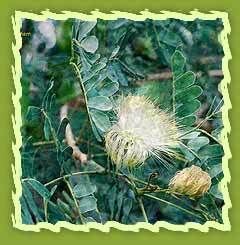 "Medium to large tree with gray-brown bark; leaves bipinnate, the primary leaflets subopposite, 2-4 pairs; ultimate leaflets opposite, 6-8 pairs, oblong, slightly asymmetric, blunt, 2.5-4.5 cm long; flowers fragrant, in loose heads, pedicellate, the head 2-4 cm broad, whitish; stamens long-exserted; pods flat, thin, pale straw-colored when mature, 15-20 (rarely 30) cm long, 2.5-3.5 cm wide, few-seeded, the seeds bulging; pods drying, opening slightly or not"
The bark yeild tannins of condensed type, viz, D-catechin, isoners of leucocyanidin and melacacidin and a new leucoantho-cyanidin, lebbecacidin. It also gives friedelin and b-sittosterol. Seeds gave crude protein, calcium, phosphorus, iron, niacin and ascorbic acid, amino acid, composition of the protein is: arginine, histidine, leucine, and isoleucine lysine. Methionine etc. The flowers contain lupeol, a & b- amyrin and a pigment similar to crocetin. Asthma, Thoracic pain, Skin diseases, Leprosy, Leucoderma, Sprains, Wounds, Ulcers, Neuralgia, Night blindness, Diarrhoea. The bark is considered as an antiinflammatory agent. Seeds are used as aphrodisiac. Saponins and tannins in the bark can be used for making soap and in tanning, respectively. Bee keepers like the species for the light-colored honey its nectar provides, and the tree hosts the lac insect. Soil-binding ability makes it useful for soil conservation plantings.